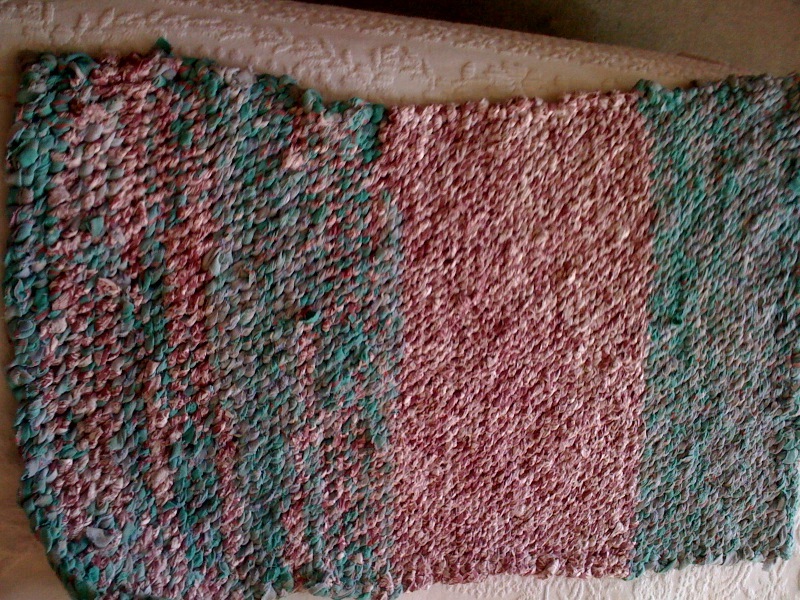 Sarah's Rags: Done my first rug! It's true that I started it last summer but I have not been working on it every evening since then. And it is not very big - just big enough to make a small bathmat. I used a large faded green tablecloth and some old pink Laura Ashley material that had been purchased to make curtains about 30 years ago. Pink and green - a bit 80s, I know. But it's done, it's a slightly weird shape with a sort of waist in the middle where my tension control and edging went haywire. 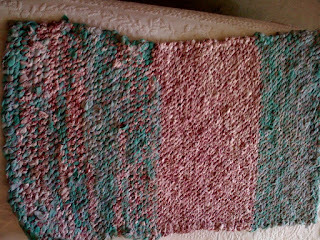 But it's done, and it's servicable, and I've still got lots of strips from these two items left over. Which helps to give me an idea of what amount of fabric one needs. Looking at this picture I have to admit it is a bloody odd shape.